Looking for another great restaurant suggestion? We recommend Charlie’s Steak, Ribs, & Ale for lunch or dinner. This restaurant is located in the heart of Branson and you’ll find it right across from the Hollywood Wax Museum! Their menu features a variety of delicious options. Begin with one of their appetizers such as onion rings, nachos, quesadillas, or hot wings. Then it’s the hard decision of picking which entree to try! There’s numerous options including: seafood, chicken, steaks, open pit barbecue, burgers, sandwiches, soups, and salads. Be sure to ask about their daily lunch and dinner specials! A different entree is featured each day at a great price! Special Sunday brunches are also offered from 11am-2pm and features all of your breakfast favorites! On top of the delicious food, the restaurant’s decor and atmosphere is also very welcoming. It features an old wagon from a Kansas farm and numerous carved Native American statues. They also have a large deck that overlooks the famous Highway 76 Strip. Live entertainment is also featured on select nights! 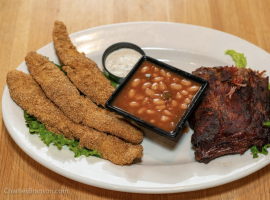 Charlie’s Steak, Ribs, & Ale is a great restaurant that should be on your list to check out while you’re in Branson! For additional restaurant suggestions and coupons, visit www.bransonrestaurants.com.